It contains 99% of matter/mass of the system. It produces all visible light; all other light (i.e. from the Moon) is reflected. It is made up of Hydrogen and Helium. Peak energy of the Sun in the yellow color frequency. It produces light/energy by fusion that is by the creation of larger atoms from smaller atoms. i.e. 4H atoms -- 1He atom. 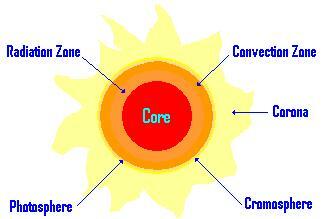 Convection Zone = movement of energy hot material rising and cool material sinking. Photosphere = where most of light is created (by heat agitating atoms). Corona = irregular shaped crowning layer of Sun�s atmosphere. 2. 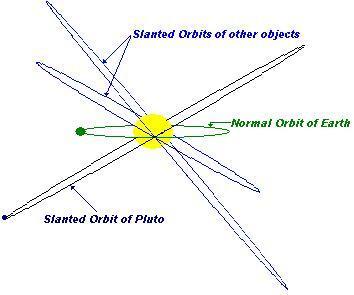 Planets and their moons � planets are spherical objects that orbit the Sun. Moons are spherical (the larger ones) objects that orbit planets. When large enough they become spherical due to their mass. (Galileo discovered the 4 moons, other than ours, in the Solar System orbiting Jupiter). 5. Comet � ice (made up of different gasses i.e. H2O, CO4, CH4, and others) and rocks. Usdually thr rocks are dust particles to small boulders; these may be the source of meteroids. 6. Dwarf planets and other Keiper Belt Objects � icy debris, orbits vary; these may be the source of some comets.